Ever since I transferred everything to my new 3DS, I’ve played with the 3D slider permanently on. With Xenoblade Chronicles 3D, though (the first game made specifically for the New 3DS, in that it won’t work on an old one) I had to turn it off, because there was just too much happening on-screen. Xenoblade Chronicles is a truly giant RPG. It has huge towns and rolling plains, uninterrupted by loading screens, and brims with detail. Its open environments bristle with people and quest icons. Thing is, for the first hour or so I spent with Xenoblade Chronicles, I found it difficult to make a lot of it out. There’s not quite enough detail on the 3DS screen to instantly make out ‘!’ quest icons above characters’ heads in busy areas, combat with multiple enemies is crazily busy, landmark icons crowd out the map, and there’s also a distinct lack of screen real-estate for maps, stats and extra info, which are crammed onto the touchscreen instead. For that first hour, I really found myself wondering what it might look like on the Vita; just like, when I was playing Xenoblade Chronicles on the Wii, I kept wistfully thinking about what it might look like on the 360 or PS3. But it’s amazing how quickly you adapt. Xenoblade Chronicles is an extraordinary game, one of the standout Japanese RPGs of the past decade, and once your eyes have adjusted to viewing its world in 400 x 240 resolution, your imagination starts to fill in the gaps. It’s a beautiful game with a likeable art style, and although it’ll never look as comfortable on the 3DS as games that were made with the console in mind, it has downgraded well to the smaller screen. It helps that it plays so well. Xenoblade Chronicles is equal parts exploration and fighting. The humans of its world live on the long-dead remains of a titanic robot called the Bionis, now covered in grass and bursting with wildlife. There’s a really interesting visual contrast between the outside world, which is green and gorgeous, and the caves and tunnels that take you inside the Bionis, which look... well, like the inside of a robot. 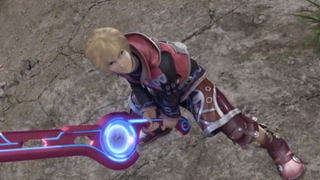 The sci-fi touches make Xenoblade distinctive – especially lead character Shulk’s ability to see the future, which has interesting effects both inside and outside battle. There’s also great, UK-accent-heavy localisation. It’s still so refreshing to play in a video game fantasy world that isn’t inexplicably full of Californians. It really helps Xenoblade Chronicles not to feel contrived, even if some of the names look like they’re the result of replacing one random letter in otherwise normal monikers (Fiora, Dunban). There are Welshmen, Northerners, Scots... and, of course, the traditional Evil Cockney Bad Guys, whose voice actors appear to revel gleefully in going wayyy over the top. For some reason I didn’t expect the full voice-acting to translate to the 3DS version, but it has. A couple of hours with Xenoblade Chronicles 3D has reminded me what a great game this is, and how refreshing it was in 2011 to play a game that warmly embraced all that’s good about Japanese RPGs without the linearity, over-complication and predictability that plagued the genre in the last generation. It’s so huge in scope that it struggles to fit onto a little console, but I’m rather impressed that it’s managing at all.